Brighten up your bedroom with these awesome DIY room decorating ideas! The teenage years are a time for trying new things and expressing your evolving personality. Your bedroom is your personal space and with our free eBook, 14 Cool Room Ideas: DIY Room Decor for Teens, you can show off your crafting skills and work off some creative energy. There is no better way to find out what you like than by doing budget friendly DIY room decor projects. You are a unique and creative person, so you should show it in your room with some of these DIY room decorating ideas. You can personalize everything. You and your friends can hang out and scroll through these teen room decorating ideas. Even if you do them together, everything will look different according to your individual styles. Spruce up your room with our awesome collection of DIY room decorations. 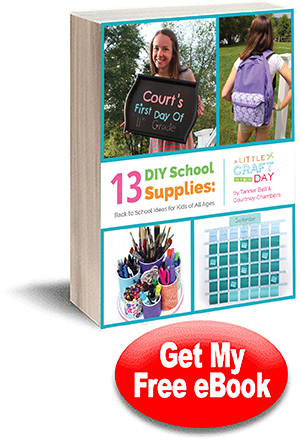 Sign Up for our Free Newsletter, Crafty Kids Creations! We are so glad you have made the plunge and downloaded this eBook! It was a smart move. With the contents of this book, you are going to be able to transform your room into an awesome space and save tons of cash. So technically, if you think about it, by downloading this free eBook you are making money. Awesome, right? You're welcome. This book is filled with all kinds of DIY room decor projects that are all pretty simple to do but will make a huge difference in your room. We think that you will really like the teen room decorating ideas and when recreating them for your room, remember that you can alter them to fit your style. Use different colors, shapes, and patterns to tailor it to match your room and express your individuality. You most likely spend a great deal of time in your room, so it should be pretty and a reflection of the amazing person that you are. Whether you are wanting to decorate your walls, need some cute storage, or are tired of your boring old lampshade, we have the solution for you and it's in this eBook! With the magic of DIY you can have the trendiest room ever without spending a lot of money on the newest cool things. You can make them yourself for a fraction of the cost. So, what project are you going to make...first? It will be hard to choose, but don't worry - you can make them all if you really want! Download your free copy of 14 Cool Room Ideas: DIY Room Decor for Teens today! Monogram Throw Pillow (pg. 18): Monograms are a simple way to personalize anything you own; and, you can choose your favorite colors and your initials design. It’s so easy to make a Monogram Throw Pillow with these step-by-step instructions and video. You will quickly learn how to monogram a pillow and soon you will be monogramming everything! However, we strongly suggest you only monogram things you own. String Art on Wood (pg. 16): Your room is going to look so unique and creative when you try your hand at String Art on Wood. This is a great weekend project to do when you’re done with homework. The materials are probably in your house or garage already. You can use your favorite color of scrap yarn to make the string art patterns. You can make any design you want with this string art DIY craft, so the possibilities are endless. Download your own free copy of 14 Cool Room Ideas: DIY Room Decor for Teens today! Ombre Paper Lamp (pg. 20): With a little DIY creativity, you can turn a boring white lampshade into an awesome Ombre Paper Lamp. Just find your favorite color dye and get to crafting your own DIY lamp shade. Your lamp will be unique, because no one else will have the same lampshade; therefore, your DIY room decorations will be completely special and uniquely yours. Hanging Hamper (pg. 26): Gain a few more square feet in your room and make this Hanging Hamper. This DIY hanging hamper is a genius idea to save space and have a cool decoration in your room. Using an over-sized pillowcase as a hamper is innovative and works perfectly. You can choose whatever design you want for your DIY hamper; it will be uniquely yours and very useful! Download a free copy of 14 Cool Room Ideas: DIY Room Decor for Teens today! The 14 Cool Room Ideas: DIY Room Decor for Teens eBook is absolutely free! If you decided that you love the eBook and would like more free kids' craft projects, don't forget to sign up for our free e-mail newsletter "Craft Kid Creations" to become a part of our ever-growing kids' craft community. It can be difficult to be a teenager, because you're struggling with new changes and figuring out who you are or will be. Have a little fun discovering what you like, and maybe what you don't, with this collection of 14 Cool Room Ideas: DIY Room Decor for Teens. From DIY lampshades to DIY wall art, this free eBook is great for kids who want to feel good about their room decorations and stand out amongst the crowd.